For as long as there have been families, one of the routes to developing culture and heritage has been through the family kitchen, which in this day of nuclear families, the internet, and the latest eating fads, is loosing continuity. 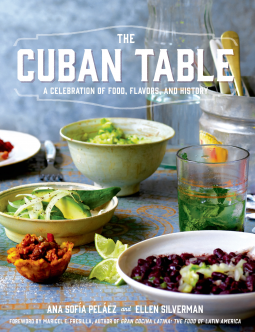 This familial and historical aspect of cooking permeates every page of The Cuban Table: A Celebration of Food, Flavors and History. This is not a book merely of recipes, but a love-letter to Cuban cooking. The author, Ana Sofia Pelaez, clearly cherishes her subject, as does Ellen Silverman's camera. There is background from the author, and a sense of history of the recipes and culture. Now I want to visit Miami and seek out Cuban restaurants, and maybe even find my way to Cuba to stay in a casa particular (a private home with rooms for guests) and check out the family restaurants called paladares. I have not tried all of the 100+ recipes; but I am in the process of making a dent in them. In my head which has no Spanish in it, their exotic names feel like some kind of magical incantation: Rabo encenido, batidos, quimbombó. I feel a little like I have a secret eye into the Cuban kitchen, knowing (now) that Cuban cooks are fiercely protective of their cooking secrets. Translating the food from the page to the plate feels like an adventure for me. Sadly, however, since I am not really familiar with Cuban cuisine, I have no way of knowing if my efforts (delicious as they have proven to be, even with my low carbing them), I really don't know if they hit or miss the traditional mark. I have not been intrusive with my changes. Instead of putting the picadillo filling into a ball of potato, I used peppers instead. I have to tell you, the recipe was delicious, and though the flavoring (a combination of olives, onions, garlic, cumin, pepper and cinnamon!) was like nothing I have ever had before, it felt familiar. I would definitely recommend this book to anyone who loves Cuban food and culture, or to anyone who wants to expand their tastebuds. Let me draw the circle a little bigger. The truth is that if you have a mouth, you'll appreciate this book.